Since XSEED Games has brought Legend of Heroes: Trails in the Sky FC and SC over to us, I’ve come to appreciate just how good Nihon Falcom is at world building. Just as they have done for the country of Liberl for Estelle Bright’s adventures, they’ve painstakingly constructed a living, breathing fantasy take on a more modern-feeling setting, complete with its own units of measurement, history, mythology, and political intrigue. The stories for individual named NPCs and support characters progress alongside yours. Should you choose to follow along, it gives Trails of Cold Steel a more immersive experience than your average JRPG, as well as benefits such as hidden tasks, recipes, and other items you’ll find useful during the course of the game. Instructor Sara was a viewer favorite. I wish she could be in our party all the time! Trails of Cold Steel takes place in the country of Erebonia, Liberl’s slightly more technologically advanced neighbor. An uneasy tension can be felt around the country, as friction between the Noble and Reformist Faction slowly worsens, while the Calvard Republic to the east poses its own potential threat. You, as Rean Schwarzer, have enrolled in the Thors Military Academy in Trista to become a part of Class VII, a group of noble and commoner students brought together to take on the toughest curriculum the school has to offer under the guidance of Instructor Sara. 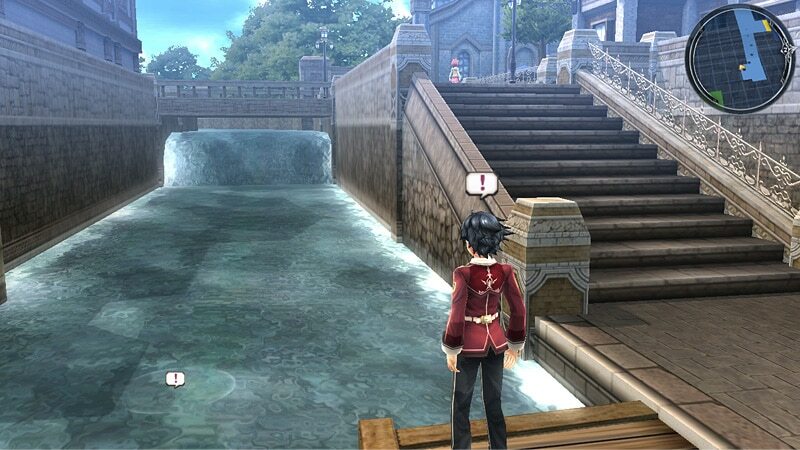 You can expect plenty of hands-on real world education, as you and your classmates travel by train from cities, towns and villages of all sizes to get a feel for the political situation, while gradually uncovering a plot to destabilize the nation which goes deeper than Rean and his friends could ever imagine. On top of this, you’re also tasked with uncovering the mystery of the old schoolhouse built upon the academy grounds, a strange shapeshifting building which isn’t too unlike a smaller scale Tartarus. It’s easy to navigate and mostly serves as a training ground and skill check before your monthly practical exam and field study trips. There are a couple of fun diversions too, like the Blade card game you can play on train trips to boost your links a little, as well as fishing. Fishing is a simple matter of button mashing, but it gets more complex and tricky later. The rewards are well worth it, so I suggest you get angling whenever you get the chance. There’s a few concepts in Cold Steel that have clearly been inspired by the latter two Persona games. On your free days at school, you’re allotted a set amount of Bonding Points which you can use to spend time with your classmates and a couple of other important characters in the story. This has the effect of strengthening your combat links, which improve your performance with a linked ally by allowing for follow up, team and group attacks, as well as auto-healing, covering, counterattacks and finishing blows. You can think of Cold Steel’s combat as an evolution of its predecessors. Cold Steel has stronger emphasis on teamwork as well as planning one step ahead, so that you get beneficial effects on your turns and your enemies don’t. The orbment system has also changed a bit from the Trails in the Sky games, now you have master quartz you can exchange with your party members to give them more attack, defense, healing power, speed, and other effects. When setting up your quartz, it’s important to be mindful of your characters’ own strengths. For instance, Alisia makes a great CP “battery” with her Crafts, allowing her to set up your other classmates for devastating S-Craft/S-Break attacks when you need them. You still need to pay sepith to unlock everyone’s slots, but this is a minor inconvenience in the early game and you’ll get more sepith than you could possibly need over time. I really enjoyed the story that Trails of Cold Steel told. As you’ll discover, each of the students of Class VII has their own personal obstacles that are holding them back from their potential. 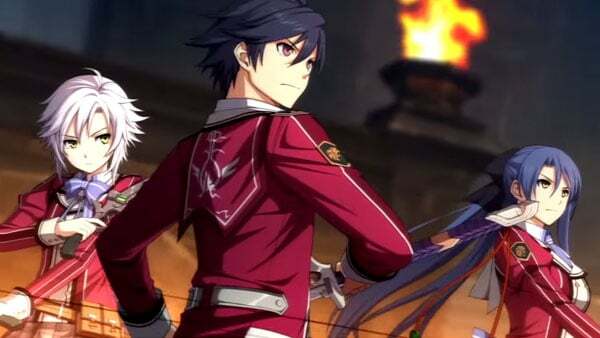 Whether it’s family squabbles, or differences between classmates that prevent them from working together efficiently, Rean and the others slowly learn to overcome the differences in their social status and backgrounds to strengthen their friendships and become a fighting force to be reckoned with. Troubleshooting the problems in each locale with your daily tasks is a lot like taking on jobs for the Bracer Guild in the Trails in the Sky games, and the more of them you do, the better the rewards will be for you. Of course, there’s always trouble close by with sinister plots unfolding in the shadows, so you’ll have to deal with that as well. There’s a lot of lore to find in this game, too. Sure, you’ll hear quite a lot about what’s happening from the main characters. But if you do some digging by talking to NPCs and reading the books in the library, you’ll come to understand everything there is to know about the world around you. Important historical figures in military, politics, scientific and business positions feature prominently in Erebonia’s history. You’ll also see how the orbal revolution, not unlike our own Industrial Revolution, affects every bit of technology you encounter in the game. And yes, you will be occasionally tested on this, so study up! This is Laura doing an S-Craft — powerful attacks that can wipe out foes and really put a dent in a boss’s hit points. 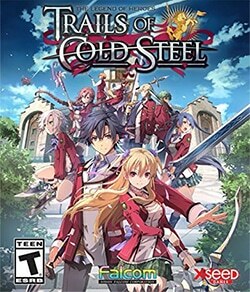 Trails of Cold Steel does look a bit dated on the PlayStation 3, but I love the art style and character designs for all the major and side characters. The game even lampshades this, for example: the students of Class VII all wear school uniforms with distinctive red jackets, but they have slight differences in the way they wear them that reflect their different personalities and backgrounds. Environments are as detailed as they can be, there’s no area I noticed that really looked barren or lacking substance. It runs at a steady 30FPS, but the framerate drops noticeably when there’s a lot of effects going on, or there happens to be a lot of characters in a scene. I did experience a couple of occasional crashes during boss fights with important cutscenes. They were frustrating to deal with, but thankfully you can hold the circle button to fast forward in order to get back to where you need to be. Cold Steel has a partial dub for the English voiceovers, and your mileage may vary on that because there’s quite a bit of dialogue in this game. However the casting and acting for the English dub was spot on. Imagine my delight, when I discovered that someone I recognized from Twitch’s Salty Bet automated Mugen fighting game channel, Sean Chiplock, (SonicMega) was the voice of Rean. I’d definitely like to see him reprise the role for the sequel coming out this year. 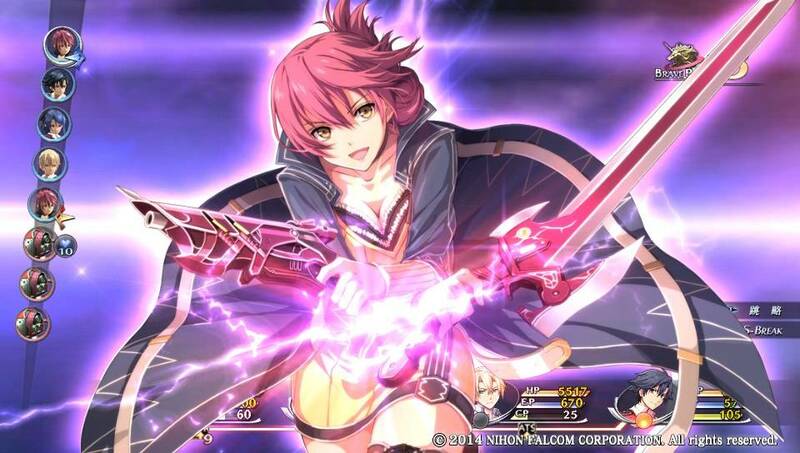 I’d also be remiss if I didn’t mention the outstanding soundtrack from the very talented Falcom JDK Band. As always, Falcom JDK demonstrates their incredible range of styles, and there isn’t a single track in Trails of Cold Steel that I don’t like, which is rare for me to say. After experiencing two full Trails titles (I haven’t beaten SC, sadly), I can now see why XSEED Games was so hellbent on getting these games to us. They tell a more sophisticated and in-depth story than what we’re used to seeing from your typical JRPG, and we are richer for being lucky enough to have them localized. I clocked in nearly 80 hours of game time, but others have told me they’ve racked up over 100 and they’re well into their second playthroughs. 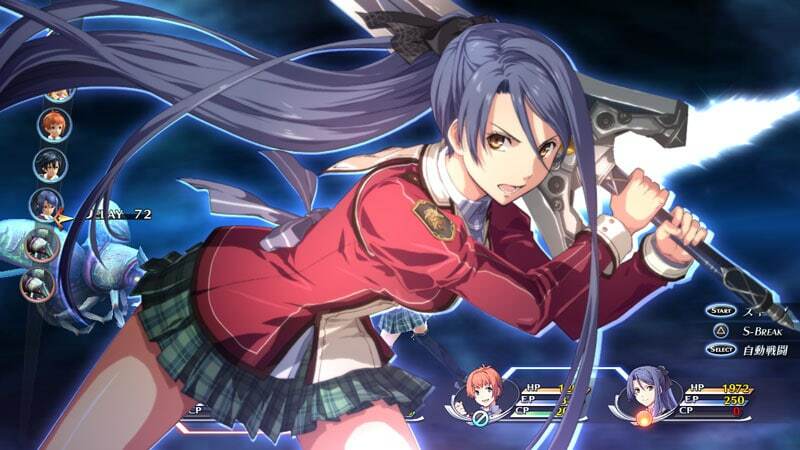 Trails of Cold Steel easily stands head and shoulders above the rest of the crop as the best JRPG of 2015, in my eyes. It was a last minute, just in time for Christmas surprise that’s definitely worth your attention and a great addition to any RPG fan’s collection. The asking price of $49.99 is reasonable too, considering the sheer length of this game. I’m eagerly awaiting the sequel to arrive later this year. Joe is the reporting manager for oprainfall, he is also a broadcaster on Twitch and loves showing off many of the games we report about on his channel. He has also been known to defended Senran Kagura from those who only want to accept it at face value.